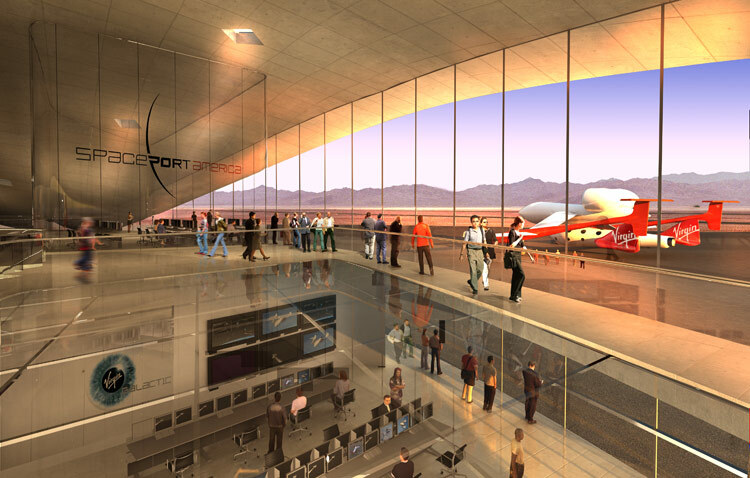 A quick flashback: Back in 2005, Virgin Group’s latest venture, Virgin Galactic, and the State of New Mexico had announced that they had reached an “historic agreement”—that they would build a state-funded $200 million spaceport in New Mexico. 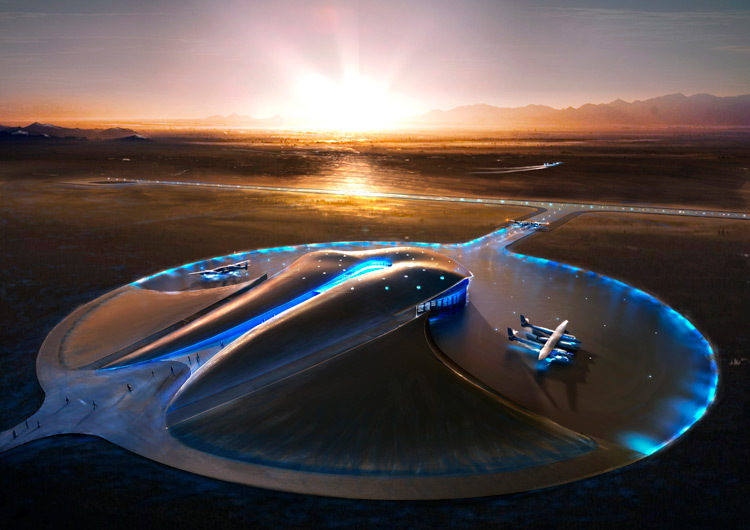 Virgin planned to provide sub-orbital space flights to the paying public, along with sub-orbital space science missions and orbital launches of small satellites (and much later, even orbital human space-flights). 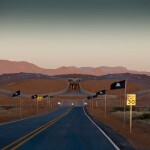 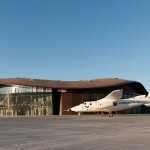 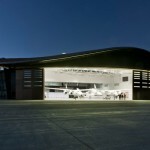 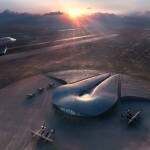 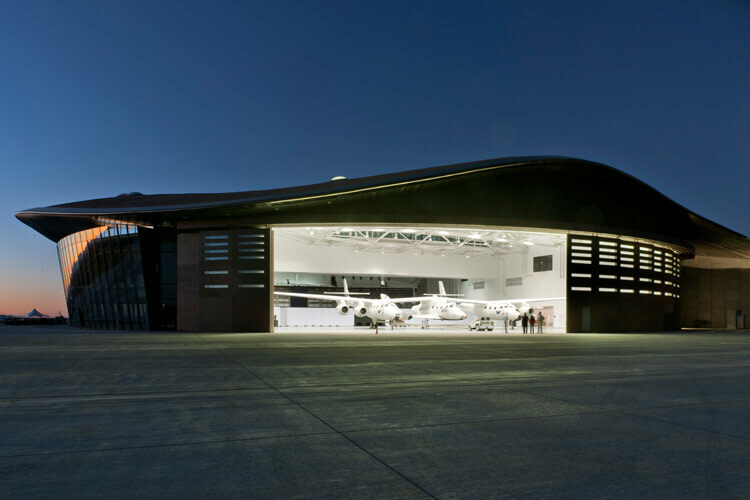 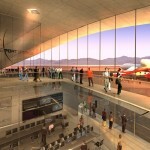 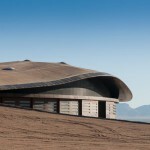 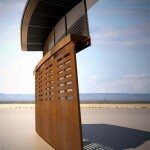 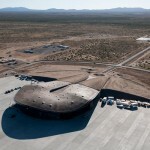 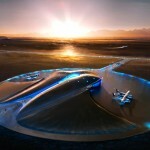 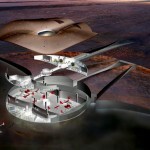 The facility was to be designed by Foster + Partners, who won Virgin Galactic’s international architectural competition. 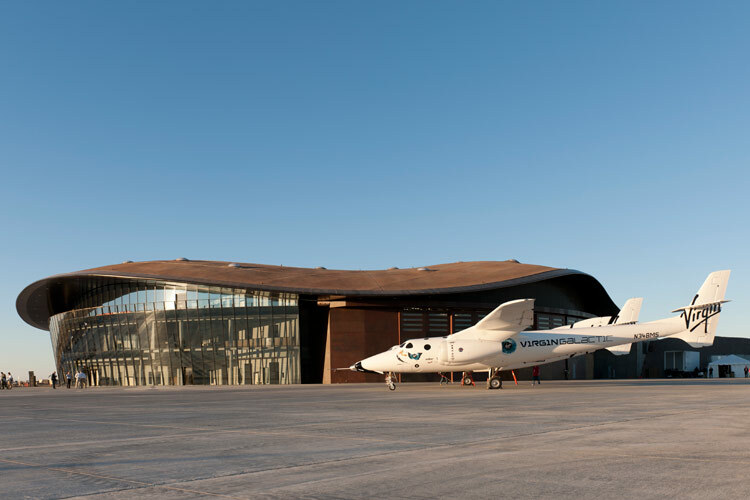 Now, the Virgin Galactic Spaceport America—the world’s first commercial spaceport—has officially launched. 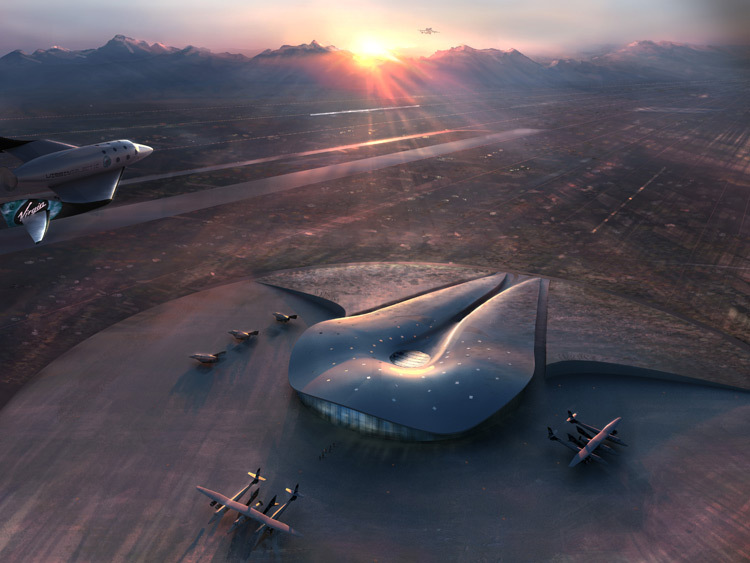 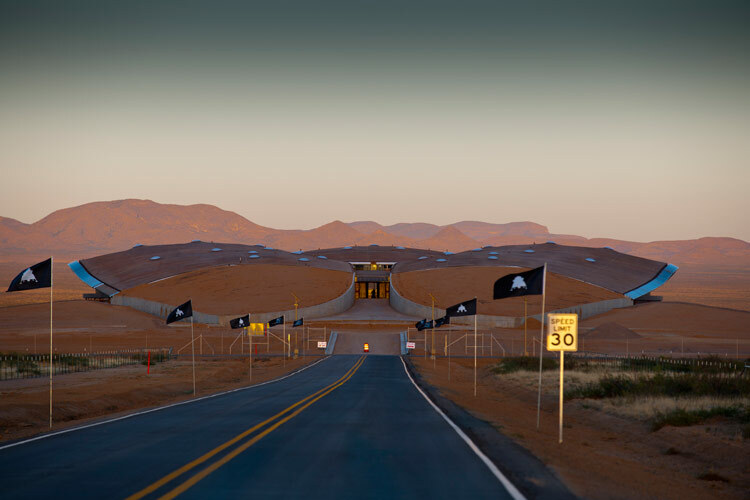 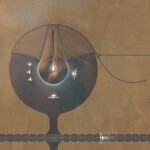 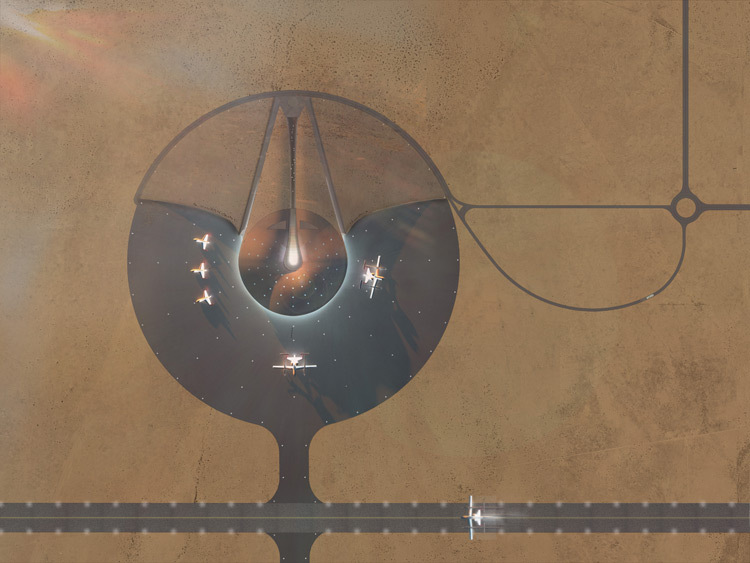 Aimed to “articulate the thrill of space travel for the first space tourists while making a minimal impact on the environment,” the spaceport is designed to resemble, when viewed from space, Virgin Galactic’s brand logo of the eye, with an elongated pupil–the elevated apron completes the iris. 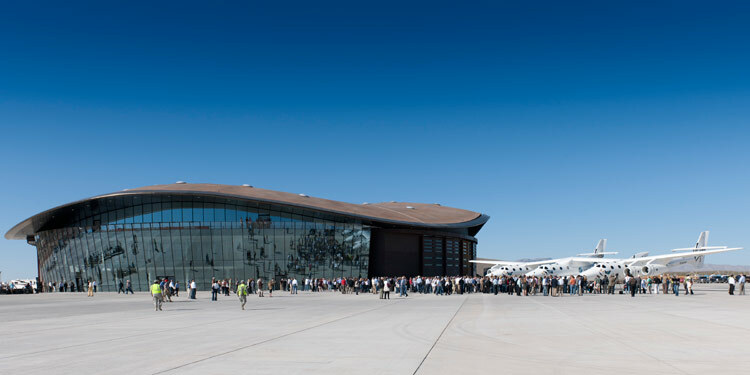 When viewed from the ground, the terminal strives to appear more of “a subtle rise in the landscape” by incorporating an organic shape and color of the facade. 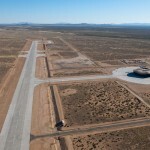 The site area is 300,000 square feet, and includes three different facilities zones: the western zone houses support and administrative facilities for the New Mexico Spaceport Authority; the central zone serves as operational heart containing the hangar and hangar support for space craft; the eastern zone includes the principal operational training area, astronaut lounge, mission control, spacesuit dressing rooms, and “revival lounge” (which we hope is not as ominous in reality as it sounds). 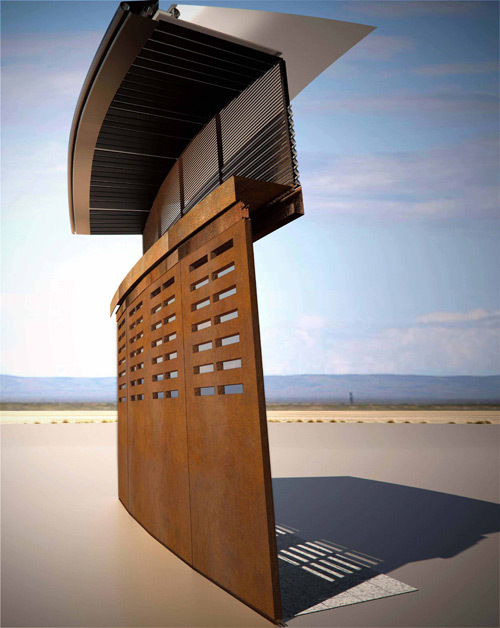 One of the challenges of the design was to achieve a sensitive balance between public versus private space. 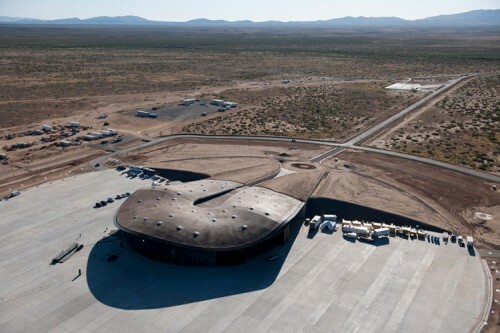 While the astronauts’ areas and visitor spaces are fully integrated with the rest of the building, more sensitive zones such as the control room are visible but less accessible. 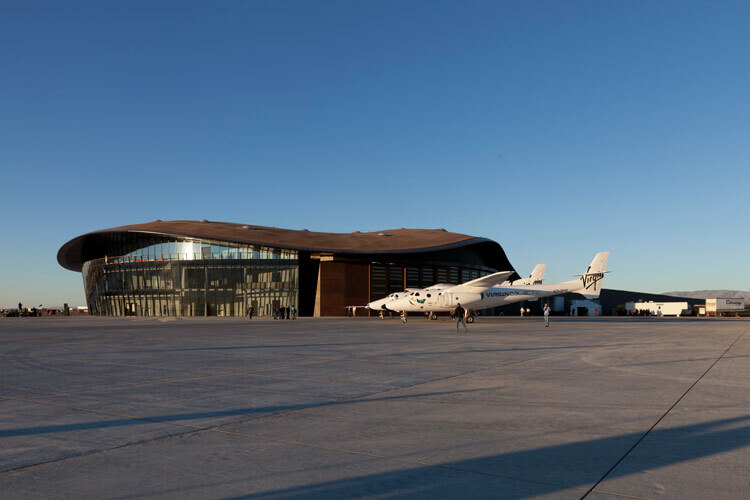 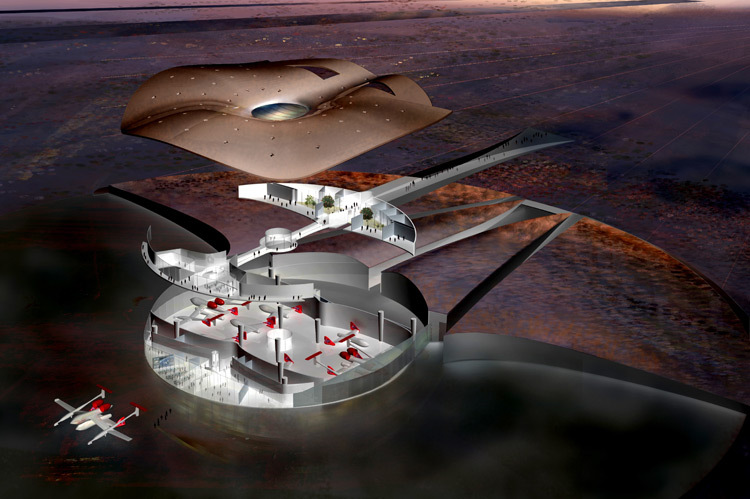 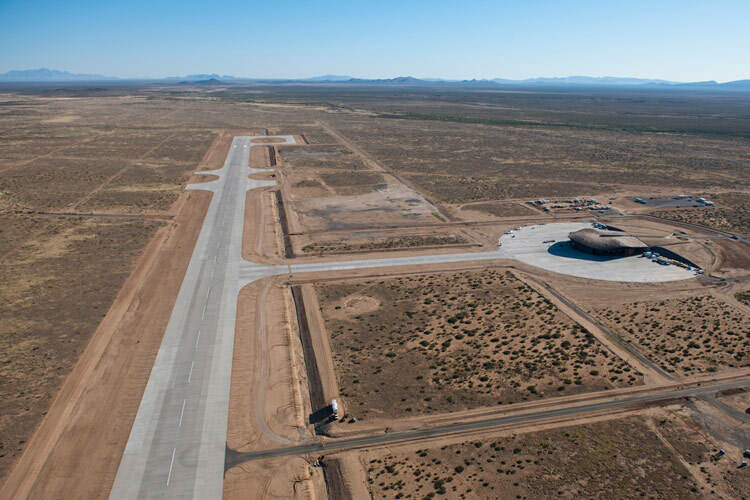 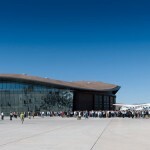 The Spaceport, which is seeking LEED Gold status, is also sustainability-conscious–its low-lying form is embedded in the landscape for earth-sheltering, which exploits the thermal mass and buffers the building from the extremes of the New Mexico climate. 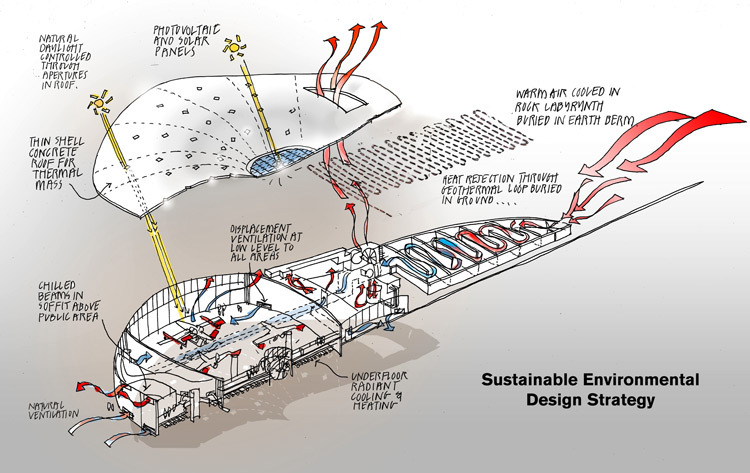 Another green element is the 100m-long Earth Tubes, which are buried in the earth berm for fresh air intake, which cools and ventilates the interior. 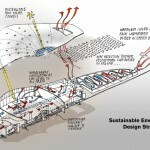 Also, the facility’s facade orientation maximizes the daylight use via skylights (with high performance low-emittance glazing and natural shading system), and uses photovoltaics for electricity; it also sports underfloor radiant cooling and heating, with coils cast in the concrete slab, and chilled beams. 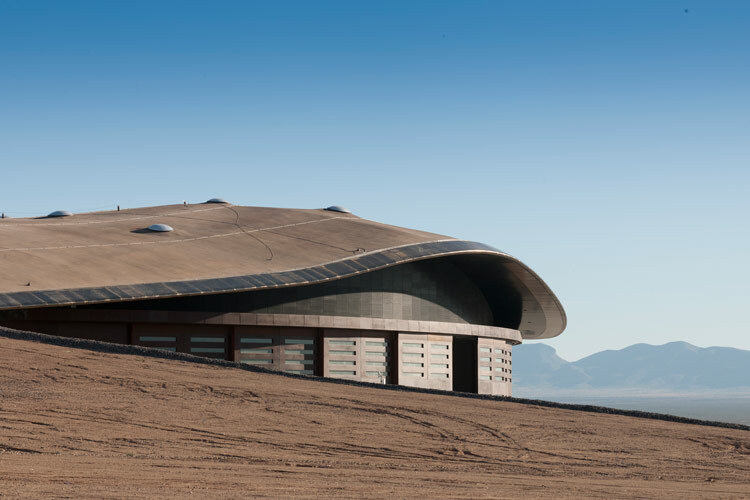 Lastly, it conserves water with graywater recycling. 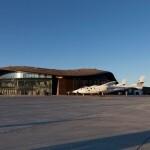 More than 450 amateur astronauts from 46 different countries have already plunked down their deposits for the whopping $200,000 space flight, which is expected to take off soon after Christmas 2012.